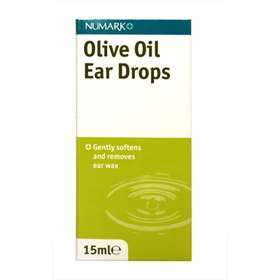 Numark olive oil ear drops gently soften and remove ear wax. Tilt head to one side with affected ear facing upwards. Avoid touching the ear with nozzle and do not nozzle into ear canal. Drop 2 to 3 drops into the ear and gently massage around the outside of the ear. Allow a few minutes for the drops to reach the ear drum, keeping the head tilted. Use the drops twice a day for up to 7 days. Repeat with other ear if required. Gently wipe nozzle with clean cotton wool after use. For adults, the elderly and children over 1 year only. The doctor, nurse or specialist may advise you with specific instructions for using the drops depending on the severity of the wax problem. You should follow the instructions to ensure removal of wax.